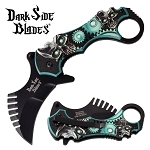 Cool karambit spring assisted pocket knife for sale. Buy this EDC knife asap because it will sell out fast. Look at the amazing skull design on the handle. The saw-back gives a nice look to the karambit blade. This wholesale knife overall open length is 7.5 inches long. The blade is totally legal length 2.5 inch steel blade. Aluminum handle is 4.75 inches long with a embossed printed design. Pocket clip is attached to the handle.